Now that the molds have been made and we'll begin making the actual body parts, there are a few things that need to be addressed, one of them being the need for Aluminum inserts. In the areas where we'll bolt things to the body panels such as hinges, latches etc. we will need some reinforcement to prevent the bolts from pulling out of the fiberglass, and to give us the ability to tighten down the bolts properly by spreading out the load not just through the fiberglass but through the Aluminum plate, thus preventing deformation of the body panel. 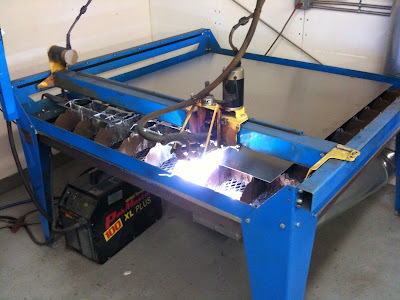 Above is a picture of the plasma cutter at work cutting out some of the 1/8" thick Aluminum spacers. You might ask why we're only plasma cutting the inserts and not using the more accurate, cleaner method of laser cutting. The answer to that question is that in production we will definitely laser cut all of the flat stock for accuracy, cleanliness, and to save time, but for now when we need the parts quickly, may have to make some small changes to them, and since they will never be visible (they will be sandwiched between the outer skin and the inner liner before we bond the two together) we can plasma cut them using the plasma table. This method by the way, is far superior in accuracy and in the time required to cut the parts by hand, particularly for some of the oddly shaped parts. Check out the Build Page for more pics. cla safflower oil where to buy Research should make us question long-held assumptions that’s one of the ways that medicine progresses. The experience that Montel Williams shared with us about his use of safflower oil is compelling and should be respected. In and of itself, however, that experience cannot be generalized to suggest that anyone else would have the same outcome.